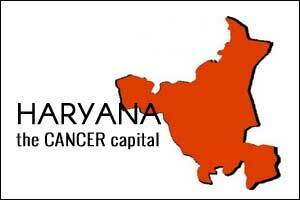 Panchkula: Cancer is strengthening its grip across India, and reportedly, Haryana has a major share, with over 39 percent of cases recorded in the state. Approximately 17.3 lakh new cancer cases are being estimated by the year 2020 in India, therefore with the present trends Haryana might have around 6.5 lakh cancer cases by then. Breast cancer has a majority share of cancer cases and is the leading cause for deaths in women suffering with non-communicable disease. According to an Indian Council of Medical Research (ICMR) report, breast cancer shares 10% of all cases. By that rate, Haryana may report around 2 to 2.5 lakh cases alone. “Approximately, 1.5 lakh breast cancer cases are being reported in the country every year and the incidence is showing an upward trend. One in eight women is known to develop breast cancer cases at some point of time in life. We suspect that the number might be higher. Due to lack of awareness amongst people and social stigma, a lot of women ignore symptoms and are wary of coming to doctors for diagnosis.” said Dr. Shilva, Senior Consultant Obstetrics & Gynaecology, Paras Bliss Hospital. Diagnosis at early stage is important for any kind of cancer, for the treatment to be effective. However, it is more so for breast cancer because breast cancer do tend to show early signs by change in how breasts feel and look to an individual. An important sign is lump formation in breasts. Usually, cancerous lumps are hard mass with irregular edges, but they can also be soft, tender and rounded, and sometimes painful. However, any appearance of lump formation in breasts should not be ignored. “It is very important for women to know how their breasts feel and look because that increases the chance for a person to realize any new abnormality, which helps in diagnosing an early stage of cancer. Lump formation in breasts should not be ignored. Also, there should not be unnecessary panic. Eight out of ten breast lumps are nonmalignant or non-cancerous. However, it is only through a breast biopsy can cancerbe detected or ruled out. One should not be satisfied with other forms of diagnosis or treatment options such as mammography.” said Dr. Shilva, Senior Consultant Obstetrics & Gynaecology, Paras Bliss Hospital. Due to various societal and cultural factors, women find it hard to come out in open and discuss or get themselves diagnosed for breast cancer. Apart from anxiety and fear of being diagnosed as cancerous, changes of appearance and not feeling good about one’s body are also stressful factors. The treatment options like chemotherapy are in itself psychologically challenging because of their side-effects. Other than psychological and medical reasons, family and husband support are essential, and lack of such support or prejudice pertaining to the disease affects a potential patient psychologically preventing her to come go for check-ups. Cancer treatment options are sometimes expensive and that also acts as a limitation in going for timely treatment. Breast cancer can be cured if it is timely diagnosed. To reduce the number of deaths due to the disease, myths surrounding the disease need to be busted and awareness about the disease and treatment options needs to be spread far and wide. Policies need to be framed to help the poor avail better treatment options. A combined nationwide effort is needed from all stakeholders to prevent this disease from becoming a national crisis.” said Dr. Shilva, Senior Consultant Obstetrics & Gynaecology, Paras Bliss Hospital.